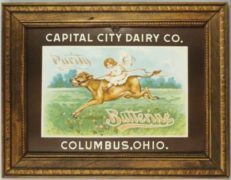 This Waterloo Ice Cream Celluloid Button Sign was manufactured for The Waterloo Milk Company in Monroe County, Circa 1925. 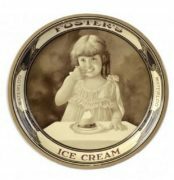 This celluloid over cardboard ice cream sign is an early sign from shortly before World War II and is considered rare. 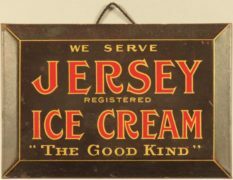 This sign was likely produced with a quantity of less than one hundred and placed in small shops that sold their ice cream. 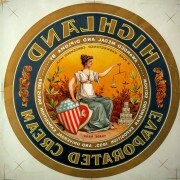 The Waterloo Milk Company was a dairy based in Waterloo, Illinois of Monroe County. That dairy was in business around 1900 to 1969. The Waterloo Milk Company was originally founded as the Fountain Farmer’s Creamery Company in 1900 and changed it’s name in 1918 to the Waterloo Condensed Milk Company. In 1925, the business changed its name again to The Waterloo Milk Company. The dairy manufactured white whole milk, chocolate milk, cream, orange juice, grape juice, ice cream, cottage cheese and butter. The company went out of business in 1969 and the city used the buildings for storage of equipment for thirty years. Most of the original factory buildings were torn down in 2005 to make room for a new Waterloo government building. 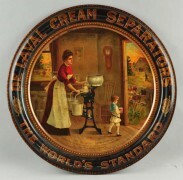 The Waterloo Milk Company created advertising pieces including milk bottles, lithograph signs, tin signs, wooden milk crates, calendars, rulers and other promotional items.